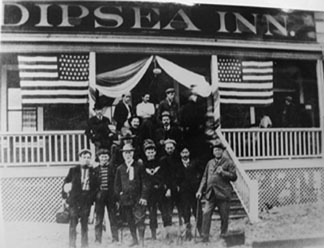 One summer day in 1904, several members of San Francisco's venerable Olympic Club set off for the Dipsea Inn, which had just opened on the Pacific Ocean sand spit now called Seadrift. They took the ferry to Sausalito, then the train to their starting point, the depot in Mill Valley. A wager was made as to who could make it to the Inn first. The challenge proved so exciting that Club members decided to make an annual race of it. The first Dipsea was held on a rainy November 19, 1905. More than 100 runners registered for what the Examiner proclaimed as “the greatest cross-country run that was ever held in this or any other country." Oakland high schooler John Hassard arrived at the Inn first, with Cornelius Connelly, one of only two scratch (no head start) runners, second. In many ways, the Dipsea remains remarkably akin to that first race and a runner from 105 years ago would likely be able to find his way today. In 1907, the course was slightly shortened, eliminating the final run on the sand. From 1965, head starts, formerly individually assigned, became based strictly on age. 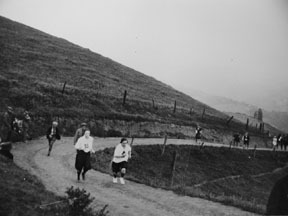 Women were officially admitted in 1971, although they had been running the race since 1950 and all-women's Dipseas held from 1918 through 1922 actually outdrew the "men's" editions. The first limitations on number of entries and on route selection were placed in 1977. In 1983, the race date was fixed as the second Sunday in June. In 1993, a Hall of Fame was established to establish some of the race's legendary heroes, such as Jack Kirk, "The Dipsea Demon," a two-time winner who ran every Dipsea from 1930 until 2003. Jack Kirk passed away in January of 2007, at the age of 100. Official Dipsea Race historian Barry Spitz will release a new centennial edition of his long sold-out, definitive book, Dipsea, The Greatest Race. Pre-publication orders are now being accepted on its official website: DipseaBook.com.